We tested the new Sealine F530, a 53’ cruiser that stands out for its elegance, comfort, and good performance. 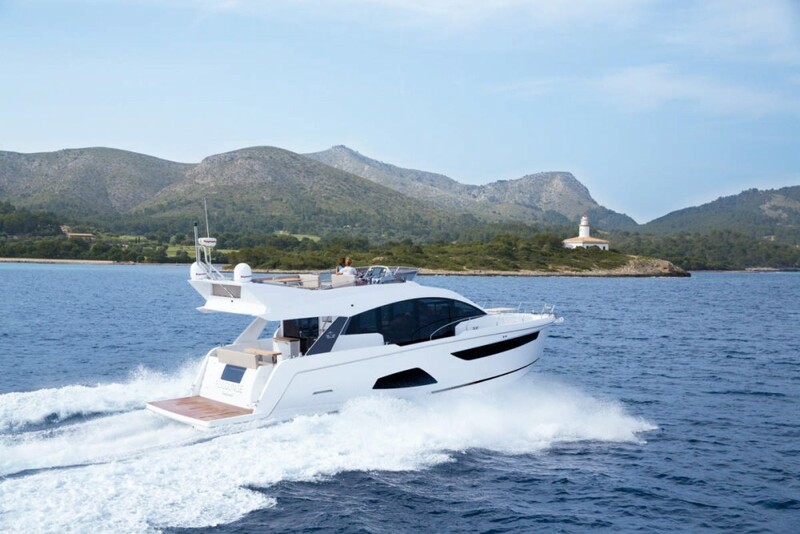 The Sealine F530 is a modern flybridge cruiser that was launched in May at the Palma Boat Show and embodies Hanse’s new philosophy for Sealine, the group’s brand specializing in mid-sized cruisers. The F530 is the most recent launch from this prestigious boatyard, which has a British pedigree—though now part of the German Hanse group. Our test of the F530 was carried out in Alcudia Bay, in Mallorca’s north coast, with flat seas and very little wind. 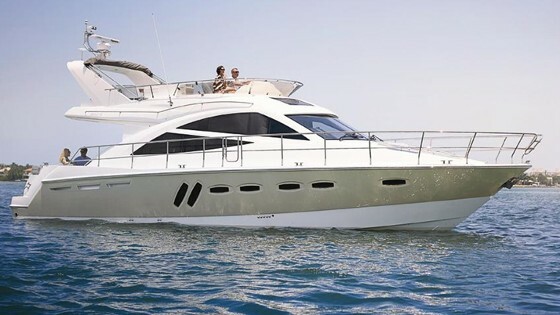 The brand new Sealine F530 is designed to be fully enjoyed both at anchor and at sea, that sort of home away from home that many boaters wish for when they go for a boat this size. The F530 has three clearly defined open-air areas on the main deck in addition to a spacious lounge, two staterooms and one cabin in the lower deck. The bow is home to a clever solarium that can be easily converted into an al-fresco dinette, lighted at night by pop-up cylindrical lamps. At the stern you’ll find a generous swim platform, which can also hold the tender. There are stairs to access the water and a shower to rinse away seawater after a dip. The aft cockpit has a long settee right behind the transom which occupies most of the beam, leaving an opening to starboard for accessing the swim platform. To port, you’ll find a two-seat settee and a small table. The area also has a solid foldable table with a stainless-steel structure and a central feature with cup and bottle holders. The table top is made of two teak boards that can be folded one on top of the other, leaving a sturdy handrail on one side. The aft cockpit is an ideal place to enjoy a great meal, since it’s located near the galley and protected by the flybridge. Two settees and a versatile table will allow for plenty of space for your guests. Photo by José Luís de la Viña. The cosy dinette is serviced by a spacious and bright galley located inside the cabin to port, which connects to the aft cockpit through a flip-up window and a practical countertop. From the aft cockpit you can access the bow via two side-decks surrounding the cabin, the flybridge via a stainless-steel and teak staircase, and the saloon through the wide folding door. The main deck has another spacious dining area that extends the galley to port. The lower helm is located to starboard, and is connected to the side-deck by a door. Below deck there are three spacious cabins and two heads. Amidship you have a full-beam master stateroom with an en-suite head. At the bow, the en-suite VIP cabin looks inviting and daylight comes in through a series of portholes on deck and large windows on the hull. There’s also a small aft crew cabin with a private head, which can be accessed from the swim platform. The flybridge is particularly spacious in relation to the length of the vessel. It’s divided into two spaces; a sun lounge forward with two double settees that can be moved to expand the solarium. To starboard you have a second helm station with everything you need to skipper the boat on your own or with a companion by your side; you’ll also have perfect views all around. A windshield protects this area, which can also be covered by a Bimini that’s stowed forward of the solarium. The sunbathing area in the bow is quite spectacular; it can be quickly transformed from sitting area to solarium by lowering the table and adjusting the cushions. Photo by José Luis de la Viña. The rest of the flybridge is taken by a very comfortable and spacious sitting area around a table serviced by a small galley with sink and refrigerator. This area can also be protected from the sun by another canopy, which means that each of these flybridge areas can be exposed or shielded from the sun independently. 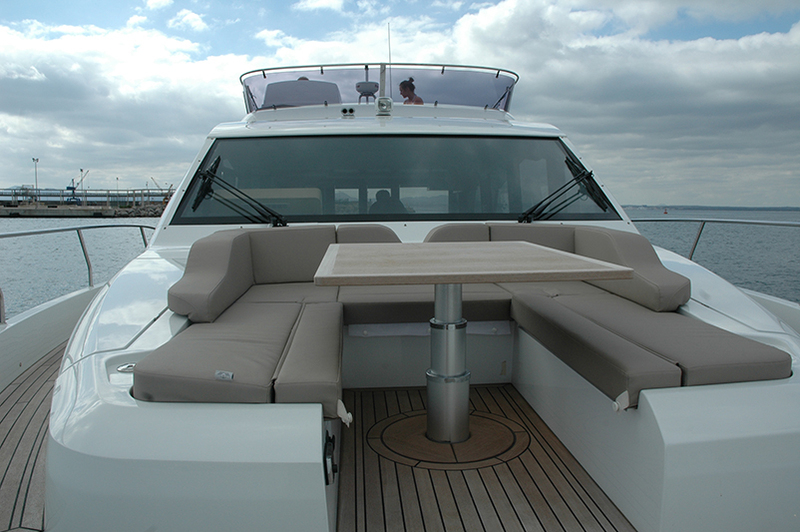 Both the flybridge and the main saloon below have a stereo system which will help enhance the mood on board. 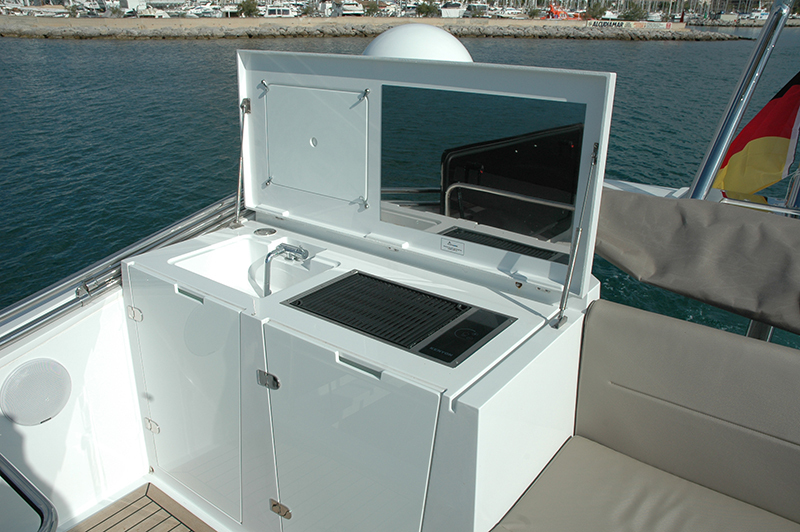 The spacious flybridge has a small outdoor galley all its own. Photo: José Luís de la Viña. 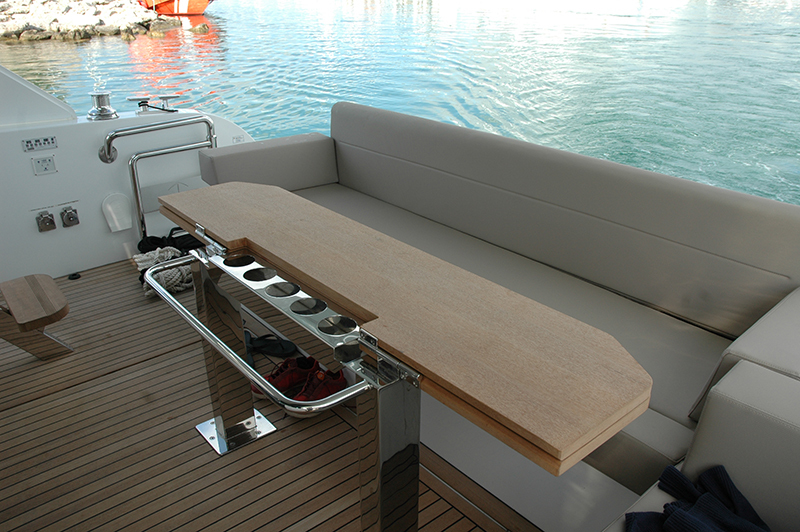 All the furniture has been studied and designed so that different areas can be configured in different ways according to the needs of the season or moment; items can be flipped up or pushed down to add extra seating or more space, as is the case of the aft cockpit table or the back of the helm’s seat. Sealine offers several colors, finishes, and furniture and upholstery options which allows the owner to customize the boat quite a lot. The design of the Sealine F530 follows current trends with an almost vertical stem that’s become fashionable and increases the loaded waterline length, although it can cause quite a lot of spray in rough conditions. The superstructure also follows current design trends with its wavy lines. The boat has been built according to the most modern methods; the hull is made of high-density foam sandwich and polyester resin reinforced fiberglass. The deck floors are teak-laid and the lower deck cabins have plenty of ports for natural light. On the cockpit coaming we found two electric winches and two sturdy mooring cleats to manage the aft mooring lines. Another set of cleats on the swim platform complete the aft mooring points. Further ahead, two more pairs of cleats are placed at intervals on both sides with an additional two on the bow, where you’ll also find the anchor windlass. On both sides of the windlass there are two hatches that give access to the generous anchor locker, where you can also stow fenders. To safely handle cumbersome docking maneuvers, the Sealine F530 comes with bow thrusters and a convenient joystick steering system. The F530 we tested had a Volvo IPS 600 pod drive system with two in-line six-cylinder turbocharged diesel engines which deliver 435 HP. This compact propulsion system saves space on board, offers excellent performance, and produces less vibration than traditional straight shaft inboards. Sea conditions were perfect for our trial on the F530, with very little wind. From the moment we started the engines we were able to tell that level of vibration and noise on deck and in the saloon were quite low. It accelerated effectively taking less than 10 seconds to go from stand-still to planing speed. At 2000 RPM we reached 10 knots, and increasing 500 RPM more we surpassed 14 knots. A relaxing and economical cruise should fall between 2800 and 3000 RPM, with speeds ranging from 16 to 19 knots. At full power, 3500 RPM, we reached 24.3 knots, a reasonable speed for a boat this size. 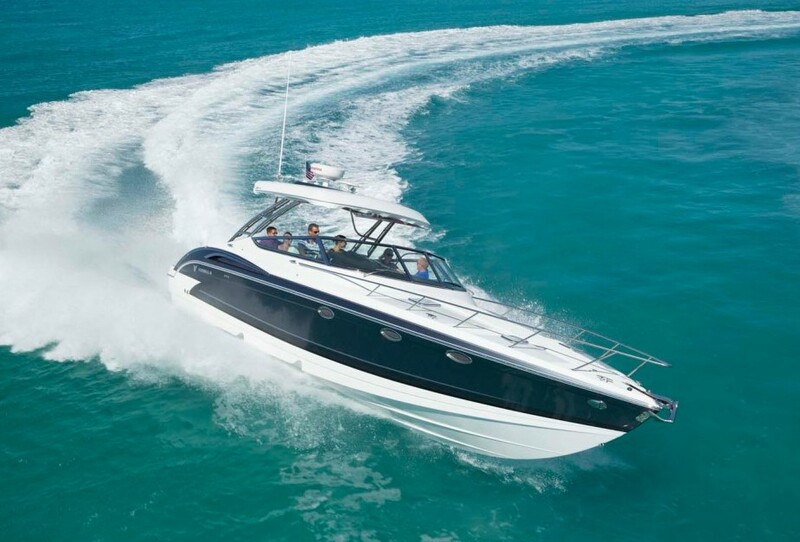 The Sealine F530 gained speed with ease and agility, creating a continuous and pleasant feeling of comfort. 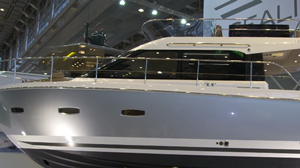 The Sealine F530 is a modern and efficient flybridge cruiser for up to 12 guests, of which nine can spend the night. Between the three open-air seating areas, saloon, and three cabins, everyone can relax, bathe, eat, drink, and rest comfortably either moored or cruising. The spacious flybridge is particularly comfortable and has been designed so that you and your guests can spend hours enjoying the sea and the views, with food and drinks at hand. 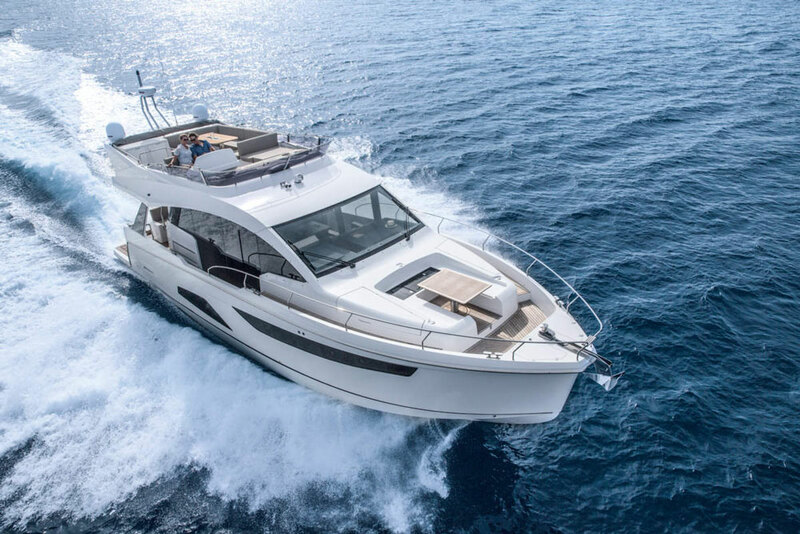 The entire concept of the F530 is balanced and effective, making it an interesting option if you’re in the market for a mid-sized flybridge cruiser that fulfils its promise. 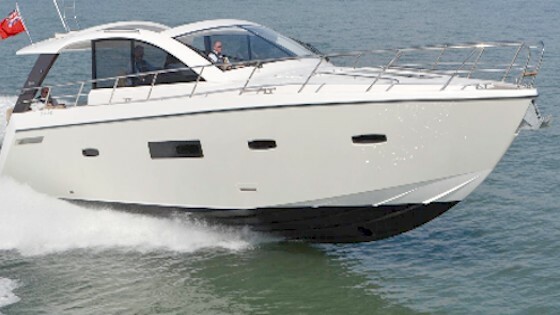 Other Choices: The Carver 54 Voyager is another flybridge cruiser with merit. 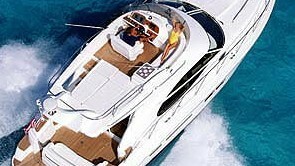 A slightly smaller option would be the Tiara 50 Flybridge. 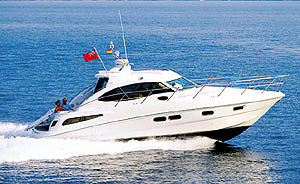 For more information, visit Sealine. Editor's Note: This story was originally published on es.boats.com in May 2016.